Have you ever been so mesmerized by something that minutes turn to hours? I have. I got positively lost in the Toulouse-Lautrec and the Post Impressionists exhibit at the Arlington Museum of Art. Capturing the most popular themes of the Belle Époque period in late 19-century Paris, this traveling exhibit showcases the birth of the modern show poster and captures what cameras couldn’t at the time. Arlington Museum of Art is only one out of 7 locations in the country to score this exhibit, which is based on an era I lovingly romanticized as a child. To give some context, I was obsessed with Baz Luhrman’s 2001 film Moulin Rouge!, the era, the costumes, etc. One of the main supporting characters is Henri Marie Raymond de Toulouse-Lautrec-Monfa, played by John Leguizamo, although he was portrayed slightly different than the historical account. They even had a character based on Jane Avril, the noted redheaded cover girl depicted in several of the prints, show posters and paintings. The point is I spent a lot of my time (every day for an entire summer) watching Moulin Rouge!, romanticizing and growing my appreciation for the era. When the lucky chance came to experience it for myself, I decided to show up on a drizzly weekday morning. First, to truly appreciate it, you have to open your mind to a great time of thinking that we’re not used to. In many ways we can relate to the feelings of a changing social and political stage, but observe each drawing like it was made of your friend watching a show, your sister getting ready to perform, your loved one dancing on the stage. Candid and delicate, these seem like more of an autobiographical memory by the artist that lived it rather than paintings or drawings meant for public consumption. No photos. Enter the world of the Nabis (an artistic movement that emphasized abstraction) and Les Incohérents (group of people creating art which became a precursor to Dadaism, Surrealism and most modern conceptual art movements). As you walk in, you notice the gallery has transformed into painted walls—scarlet red, olive green and playful bright yellow, assuming to complement the life and character of the pieces that will call the museum walls their home for a summer. I started in the southeast corner, a red wall adorned with the art that immortalized Paris nightlife. Most importantly, the focal point of the inner scarlet red wall is the iconic Tournée du Chat Noir (which I have seen prints and recreations everywhere from Bed Bath & Beyond to phone cases). The actual club, Chat Noir, was a so-called artistic cabaret where women danced and artists captured intricate moments in their lives. Fun and playful, this wall depicts the important side of the entertainment industry, the light-hearted and charming side. Caricatures of clowns and dancers in costumes fill the wall for what’s next. Over the impressionist period, these artists and social historians utilized impressive palettes of colors to present the most grandiose moments in their social and personal lives. Prostitutes, rich patrons, poor patrons, anti-patrons, performers and ladies of the night mark the Belle Époque landscape and no one was omitted from the lines sketch marks of the post-impressionist era. 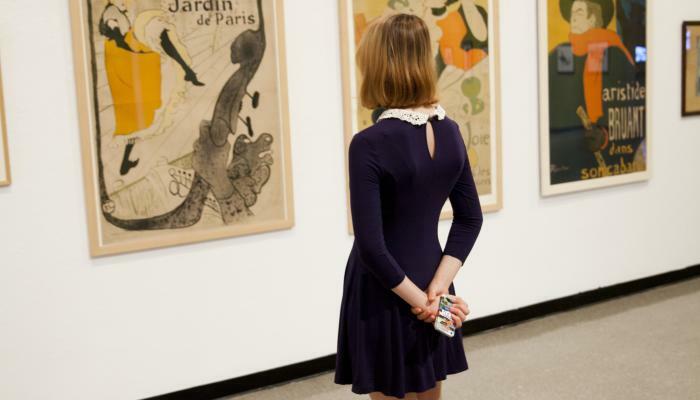 Not striving to be timeless, the works of Toulouse-Lautrec, Henri-Gabriel Ibels, Edouard Manet, Alfred Jarry and Jules Chéret to name a few, seem to be contained in time like the mix-matched frames storing them. I moved onto the next wall, where Toulouse-Lautrec’s most famous paintings, including a show poster of ‘it-girl’ Jane Avril of the Moulin Rouge. According to her history, Toulouse’s paintings of her sparked the curiosity of the town and made her incredibly famous. Then into the Shadow Theatre, which displays a few iron cutouts used to cast shadow stories as a form of entertainment. At the time, it was the closest you could get to a motion picture. If you want to know more about the exhibit and the times and people that inspired it, I suggest you watch the video located with seating room in the “Shadow Theatre.” I did, and it opened my eyes to a few things I didn’t know about, putting the exhibit into greater perspective. I then went upstairs to take a look at the mix of impressionist and post-impressionist works as well as information panels biographing some of the most important artists of the time. The exhibit runs NOW through August 16. Please don’t sit on this one, and if you’re a big lover of the eccentricities of a different era, you will take more out of this exhibit than you think you could.